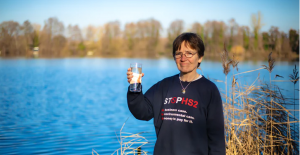 STOP HS2 | Fighting Fund to Protect London’s Drinking Water From HS2 Reaches £5,000. 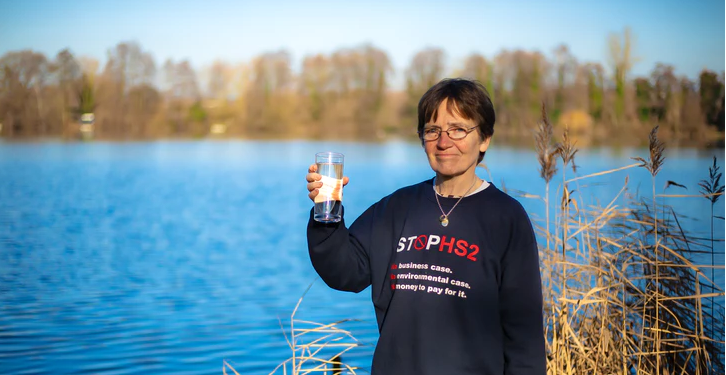 Sarah Green, the Stop HS2 campaigner who was arrested for trying to prevent HS2 contractors from polluting the aquifer that supplies water to London, has raised her first target of £5000 to cover legal fees to fight charges of aggravated trespass due to breaking a court injunction. 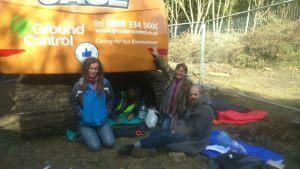 On the 11th of December, we reported that protesters ignored a court injunction to try and stop boreholes being drilled through a contaminated landfill site into a chalk aquifer, with Police making two arrests. There had been a history of direct action taking place around HS2 worksites in the Colne Valley, which started in October 2017 when protesters camped out under a digger (left), trying to prevent tree felling. The banning orders following that protest didn’t really achieve much from HS2 Ltds’ point of view, and expecting further direct action would happen, action was taken against the peaceful protection camps scattered throughout the Colne valley site. In the end, the ruling which had brought about the injunction had seemed rather bizarre in the first place, as the long-running series of protest camps had been ruled to be illegal via loophole because amongst the tents was one vehicle, with the wording of the ruling itself seeming to ban anyone from camping in the whole Borough of Hillingdon. Besides the fact that the original injunction, which upped what would have been the civil offence of trespass to the criminal offence of aggravated trespass, seemed rather suspect, the whole case hinges on whether or not what HS2 Ltd were doing was actually legal in the first place: i.e. Green is charged with obstructing HS2 Ltd from going on with their legal activities, but she claims that the reverse is true and that she was actually preventing HS2 Ltd from undertaking illegal activities. The issue with the boreholes that were due to be dug on 11th December was that they were in an area of known contamination, around the former Newyears Covert Landfill Site, and that those boreholes could release this known contamination into watercourses, and it is an accepted fact that a former water pumping station has had to be shut down due to the contamination associated with this site. Just in case you don’t understand why what HS2 Ltd are trying to do at Newyears Covert is a bad thing, here is a quick sketch to try and explain why it shouldn’t really be happening without any assessment whatsoever on the potential impact to Londons’ water supply. The thing is, there is this thing called the Water Frameworks Directive, a law protecting water supplies from contamination from pollution, and there is a requirement that before doing the sort of work that HS2 Ltd want to, that they should undertake a risk assessment. Yes, believe it or not, there are laws that exist protecting drinking water from being polluted. Who would have guessed? As you might also have guessed, like the legally required environmental assessments that HS2 Ltd should have had before they cut down trees in the Colne Valley site, assessments that would have shown what impacts cutting down those trees would have had on wildlife and habitats, there is absolutely no sign that there has ever been any assessment of what would have happened to water supplies if HS2 Ltd had not been stopped from drilling in December. 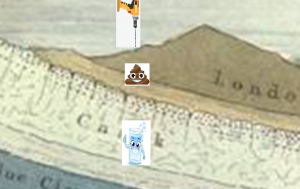 And of course, if there have actually been risk assessments of what drilling would mean for the supply of public drinking water, why have they not been published? Surely there couldn’t be anything to hide, because either there is no risk and everything is OK, or there is a risk, but that can’t be right, because if there was a risk, then surely HS2 Ltd would not be taking such a reckless action? Surely? Well that pretty much sums up the entire case, and Sarah has reached her first target, but the funding appeal still goes on and you can help out via this link. We are also very much on the lookout for an expert on the Chiltern Aquifer, and if that is you, please email joe@stophs2.org.